The weather here in North Carolina was delightful this last weekend. It was cool and overcast… hinting that fall is around the corner. We decided to go for a drive and enjoy the afternoon. 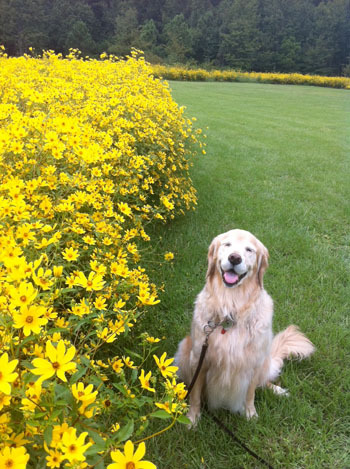 We stopped at Lake Crabtree park and were pleasantly surprised at how much there was to do there. As we ventured into the park, past sandy volleyball courts and picnicking couples, we noticed that they rented boats. $7 for one full hour on a canoe… a bargain! In my mind, all I heard was “you have a challenge afoot”. A ‘who has the best dog’ competition. 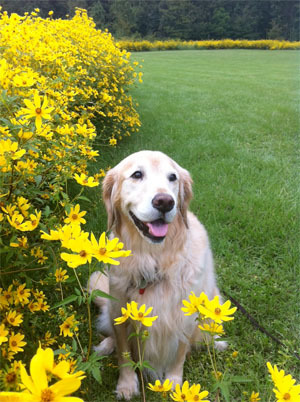 I hear “they have a good dog” and I think… “no, MEG is the BEST dog. I must prove this to the world”. Somehow, this conversation ended with us getting in a canoe, wearing life jackets. 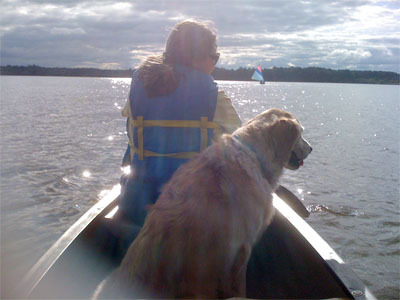 With our dog… Who has never been on a boat before. She’s been on a small train at Travel Town. But never anything in the water. 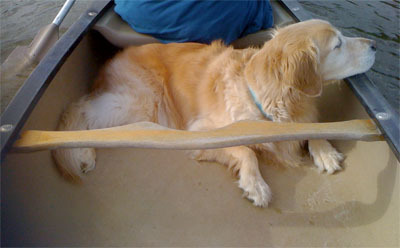 Did you know that canoes tip easily when there is any movement? I grew up riding jet skis… something without a motor, that has a very low center of gravity and requires paddles to propel… totally foreign to me. So, as our new friend pushed us out into the water, he had a very concerned look on his face as we were trying to paddle while holding the dog down and yelling “STAY!” every few seconds. The boat was wobbling all over the place. It must have been pretty comical to watch. I had my deer-in-the-headlights face on while I was thinking that I had just made a huge mistake. It took a while to get Meg to relax, and because she was behind me, I had no idea what she was doing. 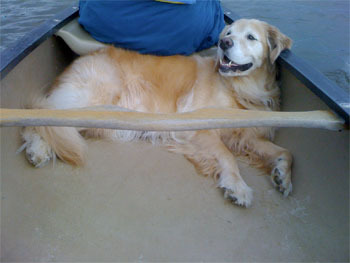 So, I would paddle, then say “stay”, then say “good girl”, paddle, “stay”, paddle, “stay”, paddle, glance, “stay”. It wasn’t the best start to our nautical adventure. Nathan had to give me updates on what she was doing and how she was handling it all. 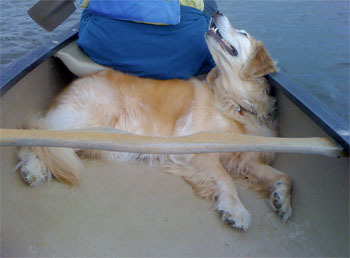 Sheer panic on my part finally turned into calm enjoyment as Meg laid down in the canoe as we paddled along the edge of the lake and got to explore. The water was calm, planes were taking off overhead and it was really an amazing experience. As we headed back, and I was bragging about how good she was being, Meg saw a bird or something equally as exciting and she quickly sat up. Of course we were in the deeper part of the lake and once again, my adrenaline started up again as the canoe started jerking back and forth. 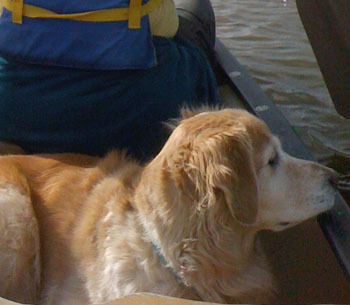 Nathan claims he had it all under control, but all I could see in my mind was us trying to lift a wet dog into a canoe while trying to tread water… shivering and laughing… then going to the At&t store to replace our cell phones later on. 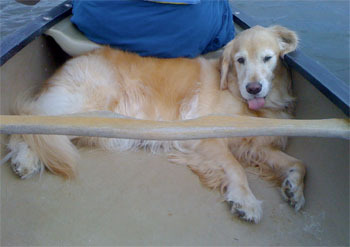 I have no idea if Meg actually liked being on the boat or not, but we’re going to try again. It was a great introduction for all of us, anyway. I really liked the parts where we weren’t on the verge of tipping over and my heart wasn’t in my throat. 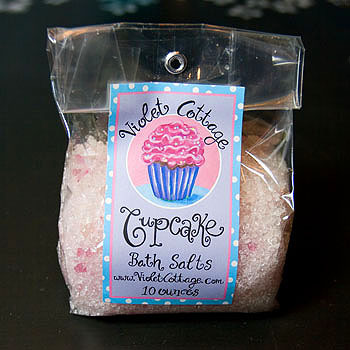 After a few requests, I started making bath salts again! 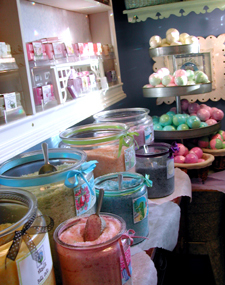 Since we can’t bring the jars to you (unless I get that bath products truck that I want! 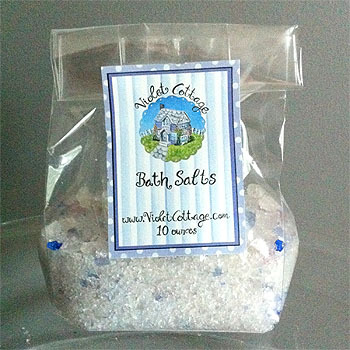 ), we’re now selling our salts by the bag. Blossom: Our Blossom scent is a mix of green apple, red apple, raspberry, red currant, a hint of strawberry and a touch of a light floral scent. Smells like summertime fruits and their delicate blossoms. Cupcake: Our Cupcake scent smells just like it sounds… just like sweet vanilla & butter cream frosting with a tiny hint of lemon. English Garden: English Garden has top notes of tuberose and jasmine mixed with freesia, sweet pea, lilac, lily of the valley. It also has a subtle hint of powdery vanilla. It smells like spring in a faraway garden. 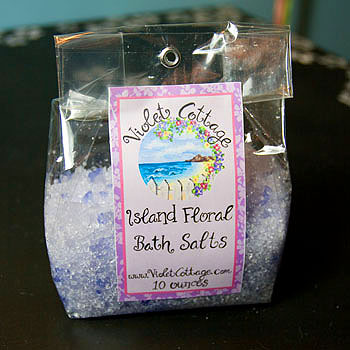 Island Floral: Island Floral is a tropical mix of pikaki, plumeria, osmanthus flower, and jasmine. 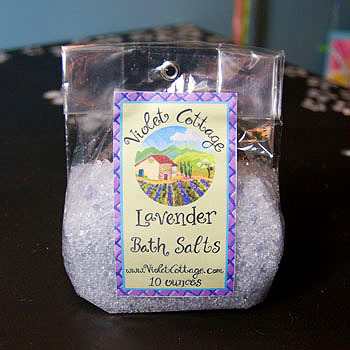 Lavender: Our lavender is a little sweeter and a lot less medicinal-smelling than most… we start with Provencial lavender and add a touch of vanilla, brown sugar and the slightest hint of lemon. The result is a sweet, warm lavender scent. 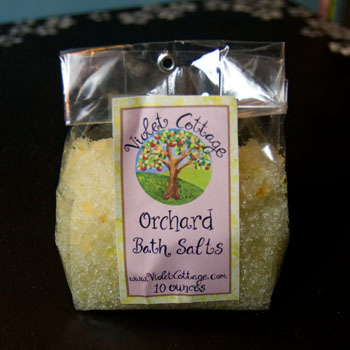 Orchard: Orchard is a mix of pomegranate, pear, red apple, red currant, fig and a hint of pink grapefruit. It’s a scent that is slightly leafy, yet sweet and tart. 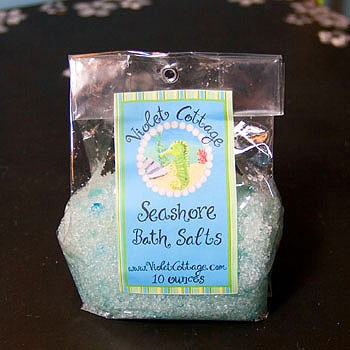 Seashore: Seashore is a very light aquatic fresh scent that starts with a watery aquaflore scent mixed with a clean marine scent, a hint of rain and a hint of citrus. 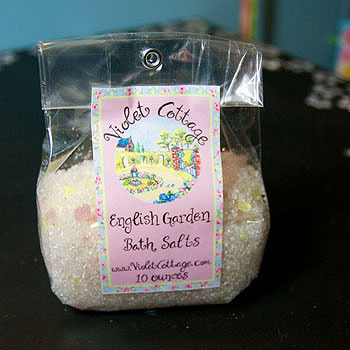 Can you tell I’m excited about the custom bath salt idea? I love matching party favors to the invitation to the cupcakes to the centerpieces to the… (and on and on). 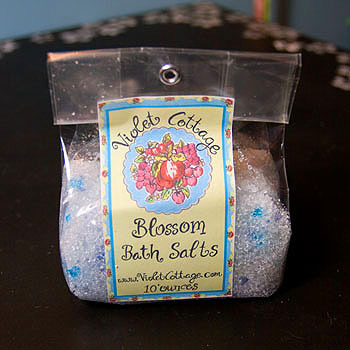 And here are the health benefits of soaking in epsom and sea salts…. it relieves stress, removes toxins from the body, regulates your electrolytes and works like an antiseptic to help heal wounds. Hippocrates, the Father of Medicine, discovered the therapeutic qualities of seawater by noticing the healing affects it had on the injured hands of fishermen. Click on the epsom salt link to read more!